In the 1950s, English-speaking Canada very much identified itself as a British country and an integral part of a wider British World, which had the United Kingdom at its centre. Canada’s bicultural nature, with the French-Canadians, complicated this self-identity in Canada. However, by the 1970s this British World had ended, as had Canada’s self-identification as a British nation. During this period, citizenship in Canada was redefined in a significant way from being an ethnic (British) based one to a more civic founded one – which was more inclusive of other ethnic groups and apparently Indigenous peoples. This paper will argue that this redefinition of citizenship took place primarily in the context of this major shift in national identity. 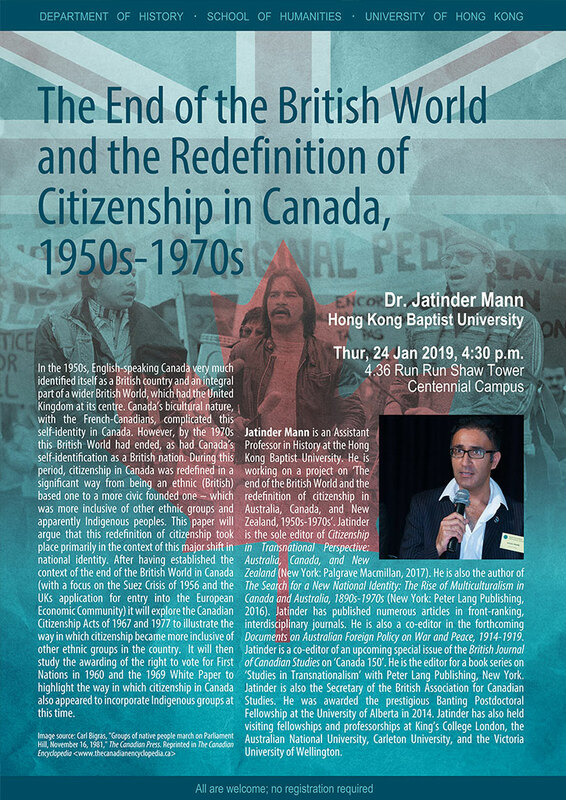 After having established the context of the end of the British World in Canada (with a focus on the Suez Crisis of 1956 and the UKs application for entry into the European Economic Community) it will explore the Canadian Citizenship Acts of 1967 and 1977 to illustrate the way in which citizenship became more inclusive of other ethnic groups in the country. It will then study the awarding of the right to vote for First Nations in 1960 and the 1969 White Paper to highlight the way in which citizenship in Canada also appeared to incorporate Indigenous groups at this time. Jatinder Mann is an Assistant Professor in History at the Hong Kong Baptist University. He is working on a project on ‘The end of the British World and the redefinition of citizenship in Australia, Canada, and New Zealand, 1950s-1970s’. Jatinder is the sole editor of Citizenship in Transnational Perspective: Australia, Canada, and New Zealand (New York: Palgrave Macmillan, 2017). He is also the author of The Search for a New National Identity: The Rise of Multiculturalism in Canada and Australia, 1890s-1970s (New York: Peter Lang Publishing, 2016). Jatinder has published numerous articles in front-ranking, interdisciplinary journals. He is also a co-editor in the forthcoming Documents on Australian Foreign Policy on War and Peace, 1914-1919. Jatinder is a co-editor of an upcoming special issue of the British Journal of Canadian Studies on ‘Canada 150’. He is the editor for a book series on ‘Studies in Transnationalism’ with Peter Lang Publishing, New York. Jatinder is also the Secretary of the British Association for Canadian Studies. He was awarded the prestigious Banting Postdoctoral Fellowship at the University of Alberta in 2014. Jatinder has also held visiting fellowships and professorships at King’s College London, the Australian National University, Carleton University, and the Victoria University of Wellington.